There are too many problems to count on this sign, sent in by Paul. Even the apostrophe in the store's name seems misplaced. And why do they feel compelled to spell "pack" without a "k"? It almost makes me think they are trying to write "park" with a Boston (or British, or New York) accent. And "thankyou" as one word? When they write "please help us," they must mean with their spelling and grammar. "No trolley's to be taken beyond mall boundary." ==> No trolley is to be taken beyond mall boundary. I worked at Pak'n Save when I was 15. I always wondered if the missing C in their name was a sad attempt to save on sign-writing costs. 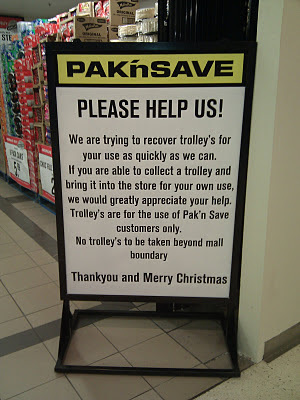 They should borrow one of the apostrophes from one of the "trolley's" and add it after the "n" in the store name.